Unlike most of us, there is no question in T.j. Prall’s mind about what he wants to be when he grows up. He’s already there – he’s a bodybuilder! And in a sport that he says is dominated by straight guys, he’s openly gay. T.j. knew early on that he wanted to be a bodybuilder. The short, rail-thin kid from Nebraska who was continually bullied from elementary through high school knew he wanted to look different; he even dreamt a lot about what he’d look like. And today, at 6-foot-0, 200 pounds, he’s worked his way into his dream body. Fortunately, for his 13th birthday his dad gave him the best gift ever – his first weightlifting set. The only problem was that he didn’t know anything about working out. An uncle was big into fitness but he wasn’t around so T.j. taught himself with the help of friends and fitness magazines. As he gained some muscle and weight in his later teens thanks to the weight training and high school gymnastics, he decided to address the bully who had been in almost every class with him from grade school on. T.j. not only “didn’t take his crap anymore,” he also spoke up, telling a school counselor each time something happened. In fact, there were so many incidents that finally, the bully was permanently suspended for an entire year. His parents divorced when he was only eight-years- old. So when T.j. decided to come out in 2006, he confided first in his sister. Next he told his mother, who was pretty understanding. But his father was, in his words, super religious. Needless to say, that didn’t go well for quite awhile. But his dad’s girlfriend was very accepting and over the long-term she helped change his dad’s view to one that’s more accepting. Now 35, T.j. has graduated with a B.A. in exercise science from the University of Nebraska, Omaha and he’s created a career that is built around his love for fitness and bodybuilding. A personal trainer who is TRX-certified, he also teaches anatomy and physiology, kinesiology and contemporary nutrition in addition to a lab class at Vatterott Career College as part of their personal training career classes. He’s also spent time in the business world teaching corporate wellness. While T.j. enjoys his roles as a personal trainer and teaching classes, he really loves to compete as a bodybuilder. 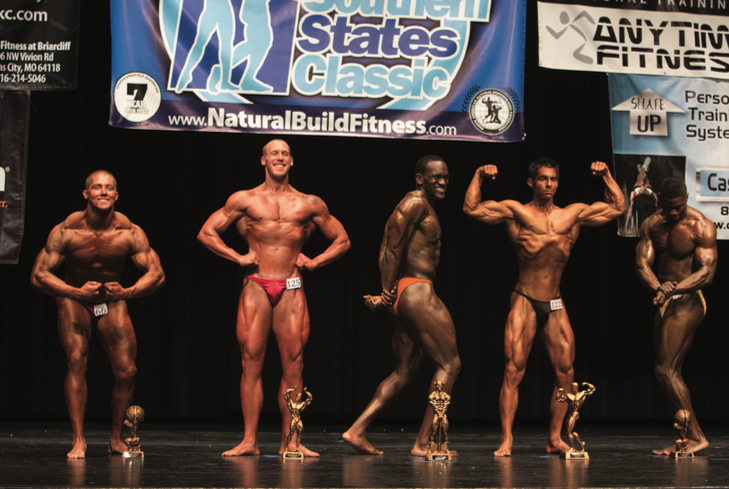 He competed in his first show in 2012 at the Gateway Natural competition in St. Louis, Missouri where he did well for his inaugural event by coming in second place (he missed first by only one point). Since then he’s competed twice in the Natural Southern States Classic, taking third place in 2013 and fourth place in 2014. This year his goal is to compete in the physique portion of the contest. T.j. also calls himself an aspiring fitness model who would love to model underwear and swimwear. But along the way he continues to support the LGBT community by helping at various Pride festivals. And to honor his mother who had breast and bone cancer, he’s participated in several of the Susan G. Komen Race for the Cure events in his area. After almost 20 years of dedicated working out and eating well, T.j. Prall still has no doubts about what he wants to be when he grows up because he’s already there – he’s a gay bodybuilder. 2016 IGLA Championships: Swimming, Diving … and Pink Flamingo?